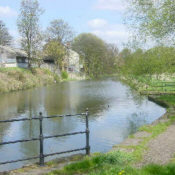 The Dearne and Dove Canal ran from the Sheffield and South Yorkshire Navigation, at Swinton, to Barnsley, Yorkshire, UK. It was 10 miles long plus two branches. It had 19 locks including the stop lock at Barnsley, plus 6 on the Elsecar Branch. The canal closed in stages following many problems with mining subsidence. The Barnsley Dearne and Dove Canals Trust is seeking to re-open the canal. Keep informed of news of canals in the area and about this website. Join the Pennine Waterways mailing list or see archive of previous newsletters. Subscribe to the RSS News Feed or receive Email News Alerts in your inbox.